what age do you plan on putting the baby in (on) the floor bed? thanks for the explanation, i've never heard of this before. also? if this comment doesn't post, i'm going to find a kitten to kick. and i just don't do that. oh thank god. i really like kittens. Mandy....I added the transition point to my post. It's the same time you'd move to a crib. But I'm assuming you can transition after a crib because really it's the same a a regular bed but without a frame or box spring. No cat's were harmed in this comment. Lauren, this is a totally late thanks for the link...I just saw this comment today. 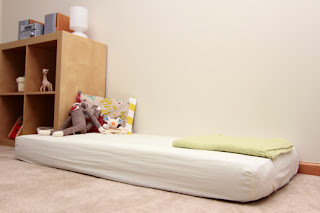 Hey- We've been using a floor bed with our bebe and have, for the most part, loved it! We can lay with her and read books, snuggle before bed, nurse her etc... Plus, she really does wake up and hang out happily with her books and toys. HOWEVER! Our 7 month old is very mobile and at nap time becomes very interested in everything, but napping. What strategies did you use to get your little one to stay in bed to nap? I have tried to just let her be and not feel the need to soothe her to sleep before every nap, but she ends up playing and not sleeping. Any ideas? Hey Emily, thanks for stopping by. I think one of the reasons it works well is because we kind of block his view of everything around, by lying next to him, and because he gets soothed.